This news reminds me of our own fight to keep the trees on the site of the dreaded project. Nobody seemed to care about 3 old trees, but 349?! 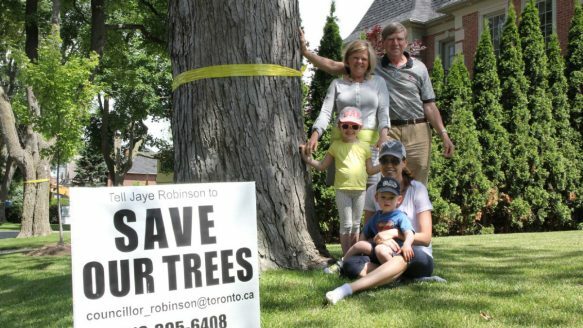 Andreana Brasseur with daughter Ella, 4, son Liam, 2, and parents David and Janice Baikie hope a city road and sewer replacement project will spare this tree in front of their home.Lawrence Park might be known as the “garden suburb,” but that’s not stopping the city from considering ripping down 349 of the neighbourhood’s trees — some more than 50 years old.